The Senators are not a fast team, or at least that’s not how they want to play. They are a team designed to win close, low-scoring games, and they’ve generally done so with an effective defense designed by coach Guy Boucher to funnel everything to the sides of the ice. But the Rangers are barging straight ahead. 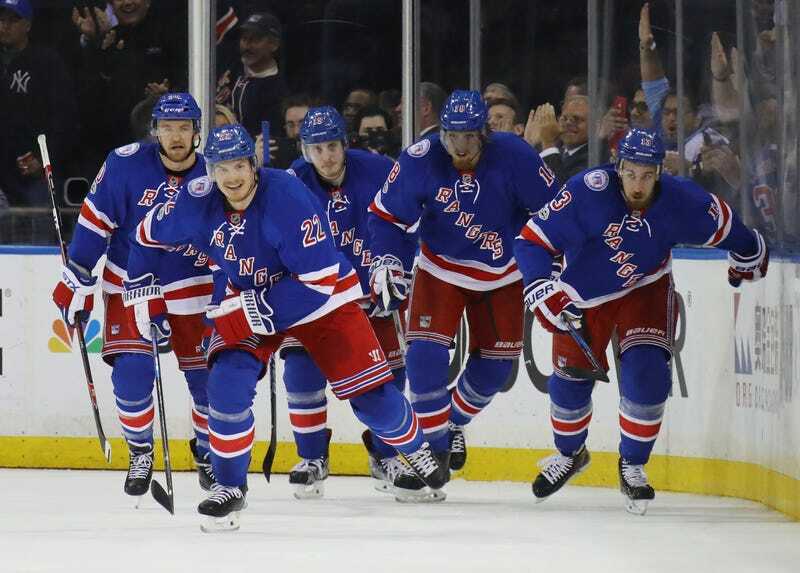 The Rangers won 4-1 last night to knot the series at two, and New York has now scored 13 goals in the last three games. The “Kanata Wall,” as the Sens’ defensive system has been dubbed (Kanata is the Ottawa suburb where the Senators play), has fallen under the onslaught of a series of the odd-man rushes that the system is specifically in place to prevent. You get the idea. This has pretty much been the scene since the series shifted to New York, and with this game 3-0 after two, the Senators threw in the towel. Craig Anderson, who’d allowed 12 goals on his last 98 shots faced, was pulled for Mike Condon. Do-everything defenseman Erik Karlsson, who’s been playing with hairline fractures in his heel and has been positively punished physically in this series, left the game with a noticeable limp. “It’s hard to replace Erik, your captain,” Bobby Ryan said. Karlsson’s diaphaneity as the series has progressed is surely a big reason for the Senators’ defensive struggles, but not the only one. Not with the way the Rangers have been able to keep threatening and keep scoring in transition, no matter who they’ve got on the ice. The Kanata Wall is, roughly, a 1-3-1 formation designed to clog up the center of the ice. It’s cousin to the trap the Devils made famous in the ‘90s, but the north-south axis extends even beyond the neutral zone. In the defensive zone, it’s intended to push the puck to the boards and force lower-percentage shots, and protect the slot at all costs. On the forecheck, it usually manifests by pinching up to the point—in the best-case scenario, keeping the puck in the offensive zone for more chances, and at the very least cutting off rushes the other way. When it’s working perfectly, the Wall is supposed to have the Senators’ outnumbering oncoming attackers by 2-to-1, or 4-to-2. Those quotes were, you’ll notice, from when Ottawa was still up 2-0 in this series, before the Rangers solved something. The simple answer, and a correct one, is that the Rangers are fast. They’re built to be fast, to score in transition, and they love to cheat out of their own zone to try to set up rushes the other way. That can be defended against and neutralized, but only for so long. The Rangers’ real strength is their depth—they have four lines capable of pushing play, and over the course of a game or a series, that constant pressure can exhaust a weary, banged-up defense like Ottawa’s. Oscar Lindberg, thriving on a line with J.T. Miller and Tanner Glass, has scored three goals in the last two games. And not the only depth forward doing work. Three of the Rangers’ four goals last night came with bottom-six forwards on the ice, and all four lines scored a goal apiece in Game 3. This New York-Ottawa matchup was an intriguing one from the beginning because the two teams have such different styles of play, and each seemed equipped to counter the other. The Senators, with their disciplined defense and neutral-zone disruption, were one of the few teams that could perhaps force the Rangers to slow down. The Rangers, rolling line after line of speedy forwards and with a penchant for blocking shots to spur breakouts, were one of the few teams that might have the weapons and the depth to simply overwhelm the Kanata Wall. New York has probably been the better team in all four games so far, but in the first two, Ottawa kept things close and did just enough—their hallmark. But in the last two, it’s been all Rangers. Maybe it’s not a wall so much as it is a dam.